The official MAS 2010/2011 Blog: What's Next? ShapeShift is an experiment in future possibilities of architectural materialization. This project explores the potential application of electro-active polymer (EAP) at an architectural scale. EAP offers a new relationship to space built through its unique combination of qualities. It is an ultra-lightweight, flexible material with the ability to change shape without the need for mechanical actuators. As a collaboration between the chair for Computer Aided Architectural Design (ETHZ) and the Swiss Federal Laboratories for Materials Science and Technology (EMPA), shape-shift bridges gaps between advanced techniques in architectural design / fabrication and material science as well as pushing academic research towards real world applications. Helvepolis - Urban Design in Vitro! In this module, we become urban planner, architect and flaneur at once! We formulate our own algorithmic building-law and examine the effects in our artificial cities! Our goal is nothing less than building Rome in a day. We are exploring the diversity and the potential of cities via scripting. Data abstraction, encapsulation, modularity, polymorphism, and inheritance are brought to urban design. Using the flexibility of specially constructed wires, industrial knitting machines from the german company Stoll are used to form a textile with a preprogrammed pattern. In response to stimulation by an electric current, phosphor material within the wire emits light as current passes through it. The result is a uniquely urban element, which deliberately reacts to movements within its surroundings. The 2008/2009 MAS students designed and constructed a Vertical Axis Wind Turbine (VAWT) using FiDU technology. Prototypes of these were presented at the DMY Berlin exhibition to much interest and acclaim. The turbines will subsequently be tested in ETH's wind tunnels. The dimensions and proportions were based on existing studies of free-standing wind turbines. Models were used to test which forms and contours resulted in the desired profiles. Three separate wing designs were subsequently advanced and developed: a single-chamber, triple-chamber and a waveform wing. These designs lead to different approaches regarding the connection of the three-armed support. The production of the primary components of the wind turbine was accompanied by a search for suitable assembly methods. The biggest assembly challenge was combining the deformed FiDU elements in a precise and stable manner. The MAS 2007/2008 students proudly present their "G-House" at the Vienna Design Week 08. The "G-House" is a reinterpretation of the classic garden house commonly found in many central-European suburbs. The underlying premise of the design is that with a further densification of cities, the garden must begin to grow into the house. Thus the "G-House" combines the concept of the traditional shed with growth processes found in nature. 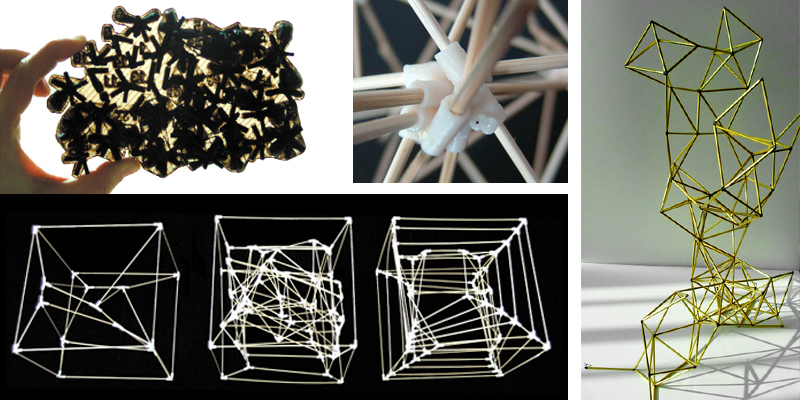 Parametric design methods based on biological growth enable the development of a complex structural system, and ultimately allow its direct digital fabrication. During the MAS workshop 'BIG NUMBERS' led by Kai Ruedenauer and Benjamin Dillenburger the students learned how to use Rhinoscript as a design tool. 3D CAD data was generated directly in Rhino not by hand but through small scripts. 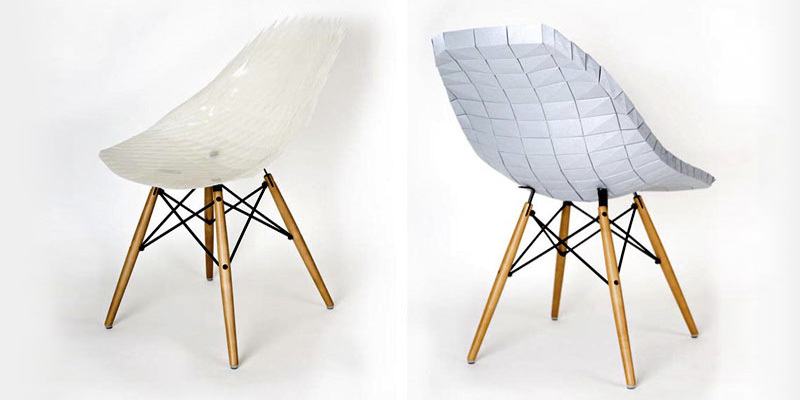 The students' final task was to recreate and reinterpret the shape of famous chairs by Werner Panton and Charles Eames. In writing their own scripts, they pursued various strategies to tessellate and break down these fluid shapes so they could be produced out of flat cardboard or plastic sheets. The tessellated 3D shapes were then flattened and output as 2D cutting paths. These were used to rapidly cut out the shapes on a CNC cutting machine. Students designed and built a lightweight icosahedron structure using FIDU ("Freie Innen Druck Umformung") technology developed by Oscar Zieta at the CAAD chair. This technology enables the formation of metal sheets into structurally solid 3-dimensional lightweight elements using air pressure. 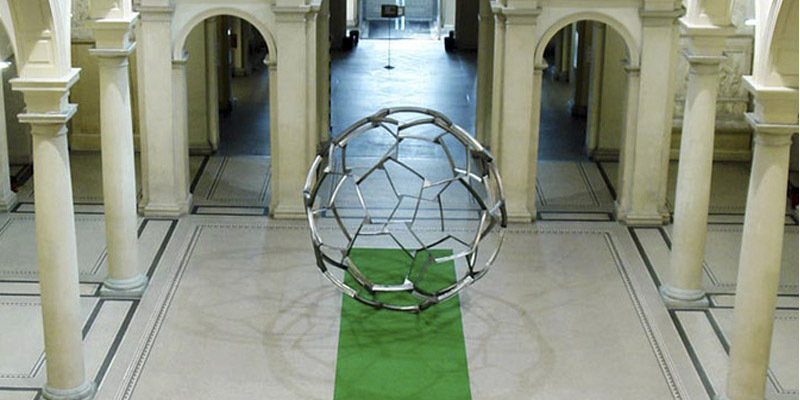 The constructed icosahedron - coincide with the EURO 2008 soccer tournament - is some three meters in diameter yet can easily be transported by two people. The cardboard pavilion is an introductory exercise exploring the digital chain. This involves the seamless process of concept, design, development, fabrication and construction - all using the same set of architectural data. 3D Rhino data is converted into individually cut cardboard sheets, which in turn are folded into units that can be assembled to create a 7 x 6 meter enclosed structure. Production and assembly time require less than two days. This module is a collaboration with artist Kerim Seiler to produce a gigantic inflatable sculpture. Students used the ncloth solver in Maya to develop virtual inflatable volumes, to simulate how volumes change under air pressure, and to examine how to control stiffness using air chambers. Sewing patterns were developed in Rhino and are penned on a Zünd CNC cutter. The finished sculpture was attached to a skyscraper, and was subsequently displayed at the Art Basel exhibition. In this module students expand their programming knowledge in Processing and begin to work in Java with Eclipse. The theme involved generating a responsive nodal structure, and eventually building this structure by designing and fabricating custom joints using the 3D printer. The X-Cube Pavilions is a computer generated and optimized structure. The outer form is a simple, clear volume. A generator defines the inner volume, subtracting it from the main structure, creating spaces, displays and tables for the exhibition. An interactive light and surface concept displays the content of the self-exhibiting prototype. All should be demountable and transportable. Due to time, program and computational restrictions which emerged during the project, the concept had to be simplified. The basic principle of the structure remained, but the integration of light, outer skin and other “extras” became non-essential decoration. The structure so became a technical, aesthetical object with no scale: complex and reproduceable in many versions. The final object is a wood-construction, whose joints are designed to be assembled without any tools and to be produced on the school’s 3-axis CNC mill.